Who can quantify the pride or commitment of a parent? 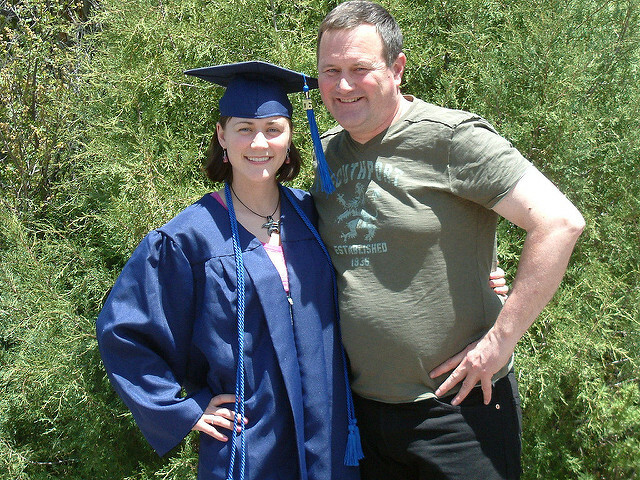 On social networks, I often see a parent sharing their happiness about their child reaching an educational milestone. One measure of parental pride, dedication, or support could include the investment they make in tools to help their children grow and learn. Technology spending among adults with children continues to increase, and especially so among those with younger school-age children. As released in our most recent wave of Technology User Profile – TUP 2017 US – our research shows that spending on home technology devices and services has increased both in volume and breadth. The number of Connected Adults with school-age children has grown, and so has their average tech spending. In TUP 2015, we found that 72.5 million Connected Adults were in households with Children. That grew to 81.2 million, as ascertained in our TUP 2017 wave. The average (mean) annual amount spent on technology devices and services is strikingly stronger for households with children than for those without children. The average annual tech spend increased from $7.4k to nearly $11k within only the last two years – from the TUP 2015 to TUP 2017 survey. 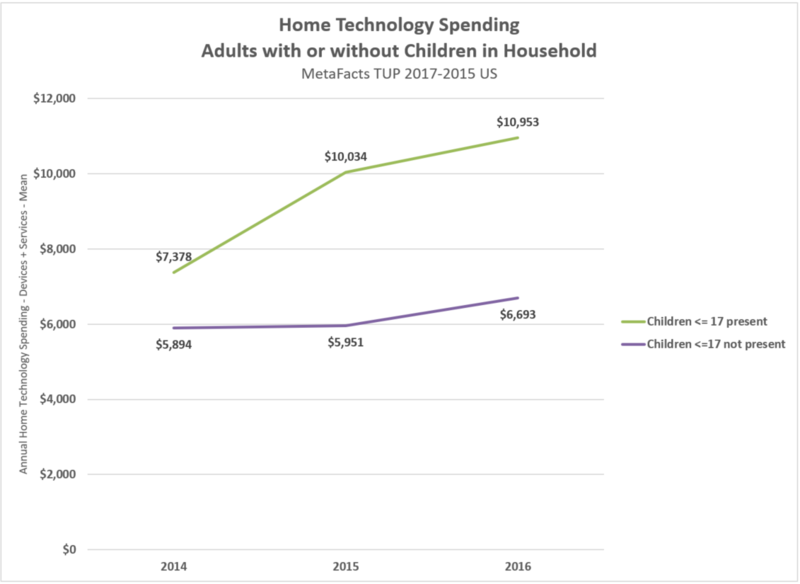 During this same time, homes without children increased their tech spending, although the growth has not been as substantial. Among adults with no children, average spending rose from $5.9k to $6.7k over those three study years. 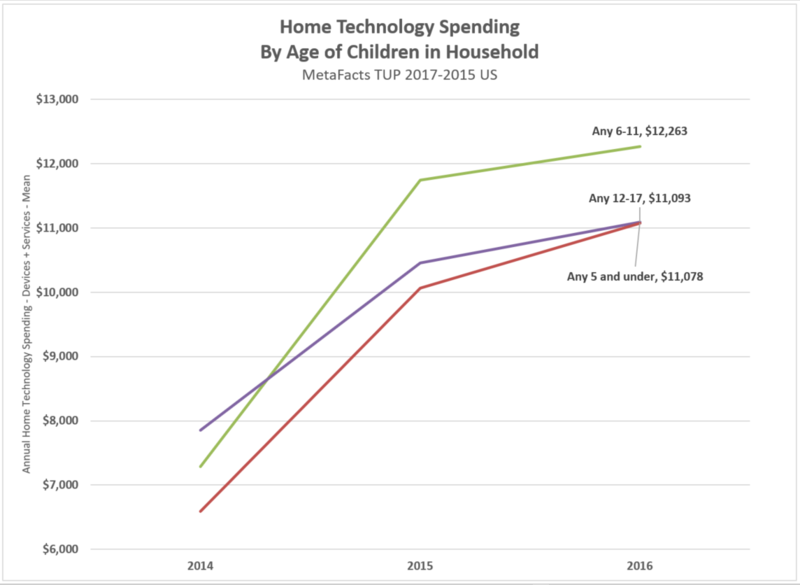 Drilling down into the TUP data just a little deeper, I noticed a more interesting difference among households with children in their tech spending. Homes with younger school-age children (age 6-11) are spending the most on home technology devices and services. Meanwhile, households with either the oldest or the youngest children have increased spending, although not by as many dollars. While not all home technology is being bought solely for the use of kids, there’s a strong association. For example, more than one-in five (22%) adults with children in their household specifically print items for children/teen education. Also, Connected Adults with school-age children (6-17) are 20% or more likely than the average to be using a Home All-in-One PC, Apple Home Mac, or Home Tablet. Parents have been some of the biggest tech spenders for decades, and this recent increase in investment bodes well for the tech market as well as for the next wave of children. Each successive generation has become more comfortable with and reliant on technology devices and services. I expect this momentum to continue as each new generation of new parents uses what they know to support their children’s education and future. The information in this TUPdate is based on the three most recent waves of Technology User Profile (TUP) – the TUP 2015, 2016, and 2017 waves into the US. Current TUP subscribers can tap into these and additional similar results about adults with children in the UK, Germany, China, and India. For more information about MetaFacts and subscribing to TUP, please contact MetaFacts.